Two UC Irvine surgeons have been elected to leadership positions in their disciplines’ professional societies. Michael J. Stamos, MD, and Ninh T. Nguyen, MD, have been named president-elect of the American Society of Colon and Rectal Surgeons and the American Society of Metabolic and Bariatric Surgery, respectively. Both will assume the presidency of their organizations in 2013. Stamos is the John E. Connolly endowed Chair of the UC Irvine Department of Surgery. He came to the university in 2002 and established the division of colon and rectal surgery and made important contributions to the growth of the H.H. Chao Comprehensive Digestive Disease Center. He served as president of the American Board of Colon and Rectal Surgery in 2011-2012. 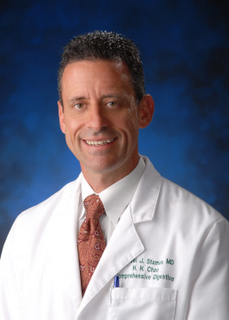 Stamos has a special interest in colon and rectal cancer, as well as inflammatory bowel disease. He has published more than 100 peer-reviewed manuscripts, 30 book chapters and has served as the editor of four textbooks, including the American Society of Colon and Rectal Surgeons’ textbook of colon and rectal surgery. 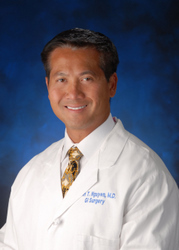 Nguyen is vice-chair of the UC Irvine Department of Surgery and chief of gastrointestinal surgery. He serves on the Gastrointestinal Surgery Advisory Council of the American Board of Surgery and is chair of the American College of Surgeons Bariatric Surgery Center Network Committee. Nguyen pioneered the development of laparoscopic esophagectomy and gastrectomy for the treatment of esophagogastric pathology and laparoscopic Roux-en-Y gastric bypass and sleeve gastrectomy for the treatment of morbid obesity. He has published more than 175 peer-reviewed manuscripts, 25 book chapters and has served as the editor of three textbooks. He also recently appointed onto the American Board of Surgery’s Gastrointestinal Advisory Council. Download our free app on your phone for easy access to health information and tools. © 2019 The Regents of the University of California. All rights reserved.